I have been working as a Permaculture practitioner for nearly 20 years. Permaculture uses a pattern language originated by Bill Mollison in the 70’s. He had the insight that if we are to develop truly sustainable people-based systems we need to come up with patterns that are already flourishing around us in the natural world. I have come up with three patterns that support both the philosophy and practicality of bioregions. This is the first of 3 posts which deals with each of these patterns in turn. Below is an illustration of the nested pattern for my own bioregion of Argyll. The first, inner circle is my home of Ron Mara located in mid-west Kintyre, looking out to the Atlantic. The next is my neighbourhood: in my case the ancient Gaelic settlement of North Beachmore. I have consulted with a number of scholars on the derivation of “beach” (pronounced “Bee-ach”). English translations vary from “birch” to “bee” to “flax”! Whatever the tree/insect/plant, it must have been significant because “More” means big, large or numerous. There are four households clustering round the old farmhouse. Being so remote, my immediate neighbours are important to me in many ways. Next are the communities of west Kintyre stretching along the west side of the peninsular, including Clachan, Muasdale, Tayinloan and Glenbarr. None of them has more than 100 folk living in them but they still have one or other of the following: primary school, post office, shop, filling station. My immediate, local friends live here. Next is what I call my “bio- community”. Each bioregion will have several of these. Argyll is defined by its coastal landscapes (no part of Argyll is very far from the sea), so I define my bio-community as Kintyre: a peninsula approx. 40 miles long and 10 miles wide that protects the Firth of Clyde and some of the Ayrshire coasts from the full effects of Atlantic storms. A giant natural breakwater, in other words. It also contains a market town: Campeltown, and each bio-community will contain one of these (even if a market is no longer held, farmers will still gravitate to it). Next is the administrative region of Argyll and Bute Council, which roughly coincides with the bioregion of Argyll. However, Argyll in bioregional language is an entity in terms of its geology and topography, not its politics. Therefore it does not include the island of Bute, which is clearly in the neighbouring Firth of Clyde bioregion. 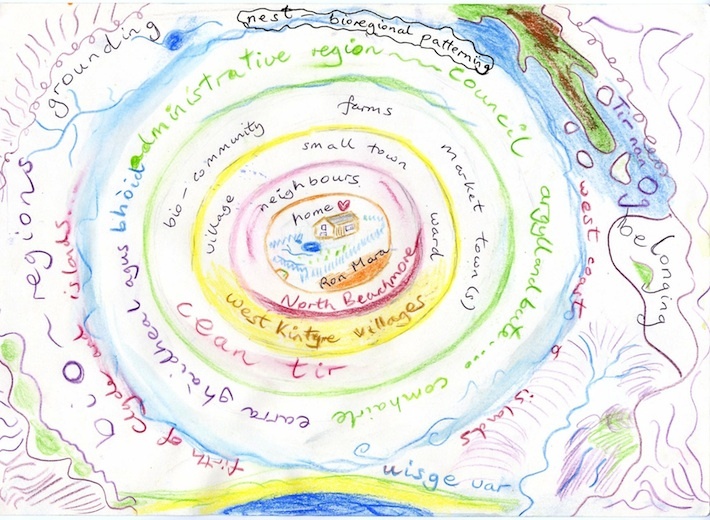 These five circles: home, neighbourhood, village(s), bio-community (market town and environs, geographical entity) and administrative region are sub-circles nestling within the great natural circle of the bioregion. Try doing a similar drawing for yourself. Start off with your home, work outwards, discover the circles beyond you till you reach the fluid, watery, misty boundaries of your bioregion. nest pattern for my Argll bioregion, West Scotland. Ed, I have been returning to your blog many times over the past weeks, visiting each of your articles to really ponder the inspiration they contain (what you have received, and what you impart!). Thanks for sharing this record of your observations and activism. I’m working on a nest image of my region, and am finding it something to grapple with. Life in an American city within a vast exurban and suburban sprawl covering many human realities presents its own complexities, and I’ve been thinking about a possible link between this heterogeneity and our isolation, fragmentation, and difficulty getting things done collectively. Your beautiful, colorful picture has given me lots to think about, and confront. I like this challenge! Emma, I am pleased you are rising to the challenge of creating a bioregional pattern for an urban environment. The beauty of patterns is that they can be applied anywhere, to any situation. You may like to consider another pattern: the lobe or honeycomb. I will make this the next subject of my blog.